Google has unveiled new versions of Android at its annual I/O developer convention with features often inspired by the previous year's iOS. The main difference: Apple can launch a new version of iOS and broadly distribute it before Google can deploy its copy of last year's iOS across even a third of its installed base. This problem is getting worse each year for Google and its Android partners. Two years ago at Google I/O 2015, less than a tenth (9.7 percent, according to Google) of Android's active installed base had upgraded to Android 5.0 Lollipop, which had been introduced the previous year (around the time of iOS 8). 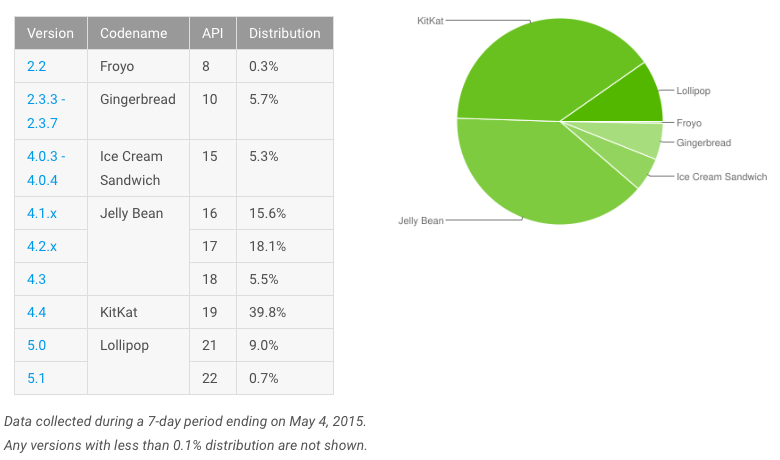 Another 39.8 percent were using 2013's Android 4.4 KitKat, then two years old (comparable to iOS 7), and 39.2 percent were still on some version of Jelly Bean, which dated back to 2012 (like iOS 6). Another eleven percent were stuck using software that was from 2011 or older. Those numbers were so dismal that it looked like Google could only improve on them. It didn't. Instead, a year later it could only report that 7.5 percent of its active base on Google Play was running its year old Android 6 Marshmallow (a 20 percent decrease in deployment success). Further, only 35.6 percent were now running a two year old Android (a 10 percent regression) and 32.5 percent were running a three year old Android (17 percent worse). The remaining 24.4 percent were using software four or more years old. That was a 120 percent increase in the number of users running extremely old Android software (at the time on the level of iOS 6 or older). Things haven't improved. Instead, a year later it can now only report that 7.1 percent of its active base using Google Play is running the year old Android 7 Nougat (5.3 percent worse than last year and 26.8 percent worse than 2015). Further, only 31.2 percent are now running a two year old Android (12 percent worse than last year) and 32 percent are now running a three year old Android. The remaining 29.7 percent are now using software four or more years old. That's a 21.7 percent increase in the number of users running extremely old Android software (on the level of iOS 7 or older) over last year and 170 percent worse than 2015--when the situation was already clearly a problem. Back in 2013, Apple began charting its own iOS deployment. Today, Apple states that as of February 79 percent of iOS users are on its latest iOS 10. Four years ago, things looked rough for Android because "only" 33 percent of Google Play users were on Google's latest version of Android. Today Google's ability to keep its platform modern, patched and updated has deteriorated even more dramatically. How is that even possible? For one thing, growth in the smartphone market has been cooling off, and even disappeared entirely in some markets over the last year. Shipments of all smartphones grew by 282 million in 2014 (growth of nearly 28 percent) but only 131.2 million in 2015 (just ten percent growth). During 2016, overall sales grew by less than 5 percent globally, according to Gartner. The rapid growth of Android's smartphone unit volumes that was expected to at some point result in a more desirable platform target for app developers compared to iOS is now gone. But it's not just volume growth that's missing. There's also the value of each unit sold. Since 2010, the average selling price of Apple's iPhones has consistently remained within $50 of $700. In contrast, the ASP of Android phones has plummeted from $441 down below $250. While iPhones used to sell at a $260 premium over the average Android, they're now selling near a $450 premium. To reach that low, corners need to be cut. The reason Android's ASP is plummeting is that an increasing proportion of devices are being sold in the mid-grade or low-end tiers. If Android were actually delivering modern phones at lower prices, new users would be cost effectively gaining access to the latest Nougat. They're clearly not. Instead, buyers are frequently getting outdated hardware with outdated versions of Android software to reach down to $100 to $200 price targets. That's despite the fact that recent Android releases have not been high-powered releases targeting expensive, premium Android phones. In fact, the primary stated focus of recent versions of Android were to enable basic phones for emerging markets to rapidly bring modern Android features to market via low cost hardware, an initiative Google's chief executive Sundar Pichai initially outlined as "Android One" for the "next billion users" back in 2014. That goal was reiterated last year and again this year for Android O, which even delivers a specially designed Go edition designed to work better on devices with even less memory and processing capacity. The Go release is also intended to run simpler apps for basic phones equipped with less than 1 GB of memory--the kind of anemic specification you'd find on an iPhone 4s dating from 2011. 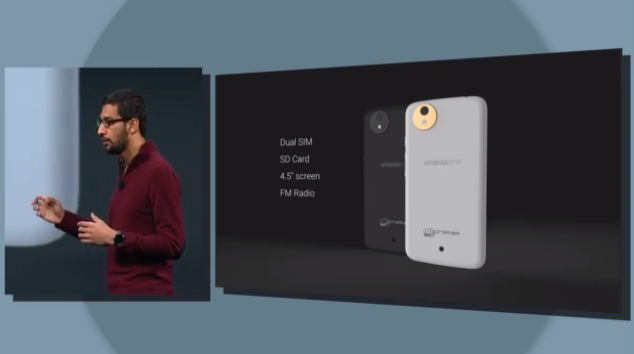 Android One turned out to be a huge flop. 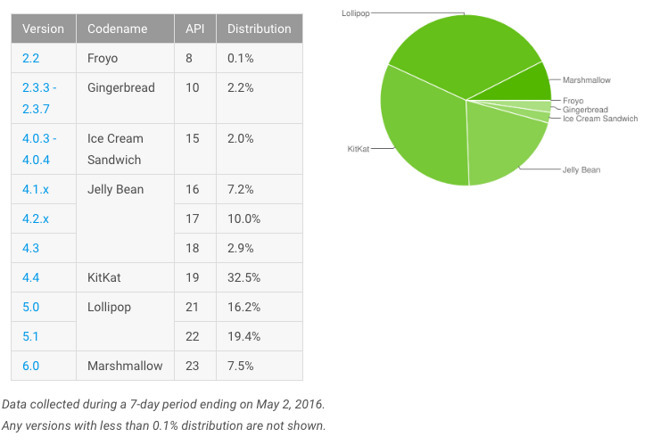 The fact that Marshmallow and now Nougat have also reached new lows for penetration in Android releases illustrates how badly Google has failed to achieve its stated objectives. This year, after the complete flameout of Note 7 last fall, the supposedly pent up demand for the Galaxy S8 failed to materialize in new peak sales. Instead, the launch month sales of S8 and S8 Plus has barely surpassed 5 million. KGI analyst Ming-Chi Kuo expects Samsung to sell significantly fewer of its flagship S8 model this year than last. This year's launch shipments are also down dramatically from 2014, when Samsung announced flagship launch month sales of 10 million. Outside of its top tier models, Samsung rarely bothers to upgrade many of its other middle tier devices, and mobile carriers often slow down the update cycle even further. It's not just Samsung that has failed in the premium tier. Particularly starting in 2015, Google itself also attempted to rustle up support for faster Application Processors for its Android partners. However, flagship Android chips continue to lag behind Apple's rapid pace of development. The oldest A9 chips used in iPhone SE and iPhone 6s models continue to beat the fastest Android chips in single core performance, and Apple's new iPhone 7 shipped last fall with A10 Fusion, a chip that remains faster than the Qualcomm chip in Samsung's most expensive Galaxy S8 phone this year. In part, that's because Apple can invest more in its custom chips because it makes more money from selling far more high end phones than any other vendor. But it's also due in part to the superior efficiency of iOS, which uses substantially less memory than Android requires. Over the last several years, Apple has been beating the performance of Androids equipped with twice as much memory--an embarrassment for Google's OS-level engineering. Meanwhile, despite pundit advice that for years demanded Apple release a cheap iPhone, the company instead launched premium, larger devices. And when it refreshed its smaller iPhone SE at a lower entry price, it gave it a fast A9 processor that kept it ahead of premium-priced Androids. As a result, Apple has the top selling smartphone in the US and Europe and decisively leads the premium price tier even in less affluent countries such as India, China and Russia. That strategy has not only kept iPhone a premium, aspirational brand, but has also resulted in Apple earning virtually all of the available profits in the industry as high volume, lower-end phone makers fight over the scraps. Google's own efforts to turn its spectacularly cheap Nexus phones and tablets into a premium-priced portfolio including the Pixel C tablet and Pixel and Pixel XL phone have sold in very small quantities despite significant advertising and marketing efforts. That's sent Google back into cheap land to try to at least get its partners selling volumes of phones that can run its services, display its ads and collect data from users. But Apple does not have this problem at all, enabling it to rapidly shift its users to new services and apps and quickly roll out new API features that its third party developers can immediately use. That helps to attract iOS development and also helps to build Apple's Services growth. Last year, Google introduced Instant Apps, a mechanism to enable components of apps to launch and run on systems dating back to Jelly Bean, reaching at least 75 percent of Google Play's active users. The primary issue Instant Apps sought to address, however, was the fact that users aren't searching Google on mobile anymore. This year, Google is doubling down on efforts to roll out Instant Apps by opening up the program to all developers. But it is also increasingly working to get its apps and services on a platform where there's a more attractive demographic of users running modern software on premium hardware: iOS. I think you're underestimating the number of capable Android handsets being sold across multiple vendors. While one single one may pale in comparison to Apple overall numbers, add up the sales of highly-spec'd smartphones from dozens of Android OEM's and I think there may actually be MORE "premium" hardware (even if not premium-priced) Android smartphones being sold than there are very-recent Apple iPhones. I think it was possibly a mistake to add the Mission Impossible self destruct option in the Galaxy models' version. I think there may actually be MORE "premium" hardware (even if not premium-priced) Android smartphones being sold than there are very-recent Apple iPhones. Highly doubt it. iPhone outsells Samsung flagships by almost 4:1. And Samsung is the number one vendor of Android flagships. Everything, from the I/O logo, to the Android Go slide in that warehouse, seems off. Nothing I've read about I/O seems interesting. But then again, I'd never consider Android so I'm not the target audience. He mentioned "premium hardware" NOT "premium price". By "premium hardware", he meant Android devices with SD 820/821/653/Kirin 950/960 (SoCs which are all capable of pushing QHD displays), 4GB RAM, QHD display etc. Basically the devices like One Plus 3, MI 5/Note 2 (and variants), Lenovo Zuk Z2 plus, Honor 8/8 Pro etc were all included in the "premium hardware" category. My guess is that - even after including all of those devices, it would be iPhones : Android = 2:1 (about 200 million iphones and 100 million Android phones with high end SoCs/4+ GB RAM). Since you asked for it, here you go!!! Android is NOT perfect, by any stretch of imagination. It will never be (much like IOS is/will be). BUT, Android fragmentation as an issue is completely blown out of proportion, than what it actually is. It is just similar to the PC space - with various windows versions (from XP to windows 10) running on different computers depending on the needs of the end-users, availability of hardware to run those versions etc. The reality is this - People for most of the time (more than 90% of the time) use the "Apps", not the built-in OS features. And all of the frequently USED apps are available and running even in 4 year old phones with Android Jellybean. So the users with old Android version phones are not really missing out on something which they desperately need (something similar to people who own windows PCs with XP/7). Security updates are a different story - Google is working on improving the situation here and need to get their act together. Why is a citation needed if he clearly stated "I think there may"? When AR goes mainstream hardware will follow, and probably very quickly. Since you asked for it, here you go!!! Android is NOT perfect, by any stretch of imagination. It will never be. BUT, Android fragmentation as an issue is completely blown out of proportion, than what it actually is. It is just similar to the PC space - with various windows versions (from XP to windows 10) running on different computers depending on the needs of the end-users, availability of hardware to run those versions etc. The reality is this - People for most of the time (more than 90% of the time) use the "Apps", not the built-in OS features. And all of the frequently USED apps are available and running even in 4 year old phones with Android Jellybean. So the users with old Android version phones are not really missing out on something which they desperately need (something similar to people who own windows PCs with XP/7). Security updates are a different story - Google is working on improving the situation here and need to get their act together. I spend two hours every day commuting by train but at different times so I don't just see the same people every day. I'm on a combined worker/tourist route so I see a nice cross section of society. If I could stop time and walk down the train checking how people actually use their phones, WhatsApp would be the most used App followed by FaceBook and then the other social networking apps. It's incredible how rare it is to see someone surfing the net for news etc. The few times I see a game it's Candy Crush etc. So your experience of 90% of the time users staying in Apps and basically abstracted from the under lying OS is what I'm seeing every day. And in places like China (but not limited to China) WeChat takes the biscuit as it is really a platform in itself sitting on top of another platform (the OS). As others have said, I doubt it, too. You would think your conjecture sounds plausible, but what are these "dozens" of high-end offerings (say, just one from each of "dozens of Android OEM's")? You hear about 3, maybe 4, phones that people compare to the Galaxy or Note. Not dozens. And IF Galaxy 8 has sold 10M, which it hasn't or Samsung would be trumpeting increase over S6, then at least another six phones have to do the same to equal iPhone. ...each and every quarter! And, as others have pointed out, Samsung is the Android leader. True, but each one of them have to sell at least a million high end devices in a quarter to meet the overall number of Apple, which I highly doubt. All Android OEMs put together, my guess is that they are selling about half of what apple sells in a quarter. And that includes the phones with high end hardware (SD 820/821, Kirin 950/960 SoCs, 4+ GB RAM) but have a mid-range pricetag (around $350 to $500). Platform consistency is critical for app development. It's akin to the console vs. PC model. When console game developers know they have x million users on an identically spec'd hardware platform and can deliver an identical experience to that audience they invest (and conserve resources that otherwise would be spent tweaking drivers, multi resolutions, optimizing for specific graphics hardware, etc). By the end of this year the iPhone base of active handsets will nearly all be 64bit, capable of running iOS 11 (and the majority of devices will be updated to the latest software), with very capable and consistent memory, screens, graphics, CPU & IO subsystems. This will provide a ripe platform for great app development. Whereas the fragmented Android market will consist of significantly different OS versions, different CPUs, graphic subsystems and capabilities, memory, screen resolutions, etc. Just like PCs that have many different hardware vendors - Android will have software compatibility issues, endless updates, and different user experiences depending on the device. It has been that way for last 5-6 years!!! Can you please point out to a huge security disaster which has impacted millions of Android users in the last 5-6 years? Yet we don’t hear much about Android users getting pwned do we? When have we heard about a WannaCry style attack on Android users that resulted in carnage? Plenty of reports about this or that vulnerability that could result in such an attack but nothing major has actually happened. Look, I’m a rabid iOS fanboy but even I can understand that a lot of this security and vulnerability FUD about Android just hasn’t happened... yet. Same goes for iOS. That's great for developers and will save them some time and money but they will still be writing for Android and dealing with the issues all the same. Q1-17 saw the $400+ handset market shrink but the same period saw the $300-399 segment grow by nearly 50%. This coincides with some Android manufacturers selling higher numbers of premium and the so-called 'affordable premium' phones. It seems that there has been an injection of capable phones onto the market and by definition, very few of them were iOS phones. That, combined with the relatively small iOS share should see many developers pursuing Android development in spite of the drawbacks of having to deal with the issues resulting from different hardware, bugs etc. The Q1 numbers might just be a blip but they could also be a trend and India especially is showing great potential in the mid tier zones.